SAP made a significant contribution of time and talent at the University of Notre Dame last week all under the theme of advancing the curriculum and strategy for Design Thinking and Design Doing at the university. 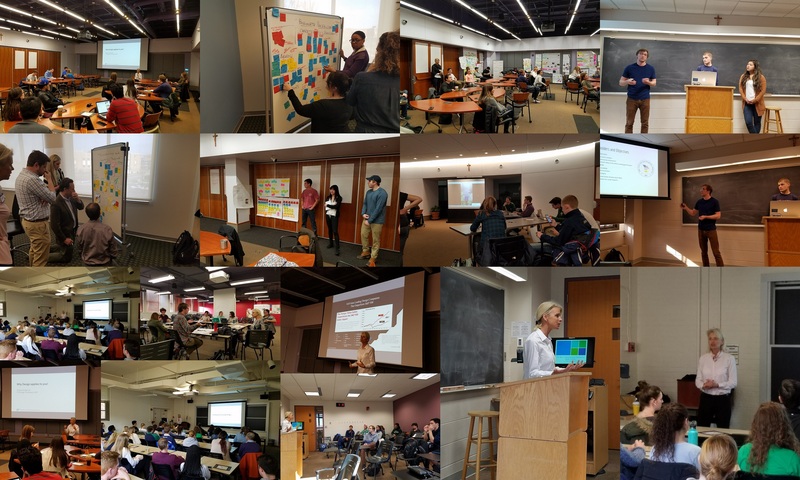 SAP’s Vice President of Design Thinking, Andrea Anderson served as guest lecturer and project coach to over 175 Notre Dame students during the week. Each interaction was related to Design Thinking and its principles which are being applied in multiple ways at the university. We had the privilege of visiting five separate classrooms and several special events over the course of four very busy days. Classes spanned the Design department of the College of Arts & Letters, classes regarding innovation and entrepreneurship in the Mendoza College of Business and College of Engineering, and a Design for America club meeting. While on campus we advanced the strategic Design Thinking conversation at Notre Dame in separate meetings with leadership in the colleges of Engineering, Business and Global Affairs. Traditionally, design has been used to connote the process by which the physical artifacts of the objects and communications around us come into being. But over the last decade, design has come more and more to describe not only the development of objects but the process by which one shapes the interactions and experiences of people with the systems, services and organizations around us. A deeply human approach to problem solving, design thinking highlights one’s ability to intuitive This course will follow a series of overlapping modules that will introduce the student to the various iterative steps employed in the design thinking process and becoming familiar with the tools and methodologies employed. The course will feature a hybrid seminar format with lectures and case studies followed by hands-on exercises and practical applications of the theories in the form of team projects. At the conclusion of the course, students should be able to articulate the tenants of the design thinking process and apply those methodologies to problems of a variety of disciplines from science and engineering to business and the liberal arts. We closed the day with an evening session at the Design for America Notre Dame club where we shared SAP’s perspective on design and Design Thinking and served as coaches for the multiple student teams working on extracurricular design challenges this semester. As the challenges and opportunities facing society and businesses grow more complex, and as stakeholders grow more diverse, organizations are increasingly seeking innovative ways to create and capture value. In this course we will explore organization-centered methods of innovation while gaining proficiency in human-centered methods of innovation through an approach known as “design thinking”. Students will work in teams and consult with a client throughout the semester to apply design thinking – a systematic application of ethnographical research, ideation, prototyping, and customer co-creation – to develop innovations grounded in the client user’s current and future needs. This project-based course combines theory and practice to give students the opportunity to apply their engineering curriculum to real projects with transformative impact in a community. The course will draw from existing resources within Notre Dame to provide a framework for students to learn the theory, methodology, and skills necessary to implement their projects. Students will be paired with mentors and community partners to work on projects that will impact the South Bend region and beyond. The scope of the projects will include researching the project theme and local context, defining the problem, brainstorming solutions, prototyping multiple solutions, and piloting the most viable prototype. Prototypes could include simulations, MATLAB graphical user interfaces, or benchtop physical models depending on the type of project. At the end of the semester, students will use feedback on the pilot project to prepare transition plans and scopes of work for future project execution on a larger scale by the partner organization. The primary partner for these projects will be the Bowman Creek Educational Ecosystem (www.bowmancreek.org) focusing on project areas within South Bend. Other organizations such as student groups or community organizations may serve as additional partners. Project topics may include, but are not limited to, smart green infrastructure, water management, data analytics, internet of things, and smartphone app development. This advanced course in industrial design explores contemporary issues related to designing objects for social good to positively impact the lives of people, society and the environment in an innovative way. Working within a human centered design process including the identification of real world problems, direct research of user needs, as well as business and technological realities, we will design product solutions and build innovation around people’s experiences. Class projects will focus on designing and testing solutions that help people, but also how those ideas are brought forth and effectively executed in the complex world of today. Integration Lab I: Innovative Approaches for Complex Global Challenges: This course introduces innovative approaches such as design thinking, systems thinking, negotiation, and implementation science; leverages the intersections of the three concentrations in the Master of Global Affairs; and examines global challenges through the foundational lens of Integral Human Development. The course’s reflective approach and emphasis on self-discovery launches students’ personal and professional journey as they build their unique Keough experience.